How much their rebate will be, we will find out this friday. You can enjoy the lowest rate with minumum usage of RM30. What does that mean? You can still get data rebate even when the rates are already the best every month. Hmm…. Your rate is lower than any prepaid, postpaid or anything you’ve ever paid. Really? We’ll see. 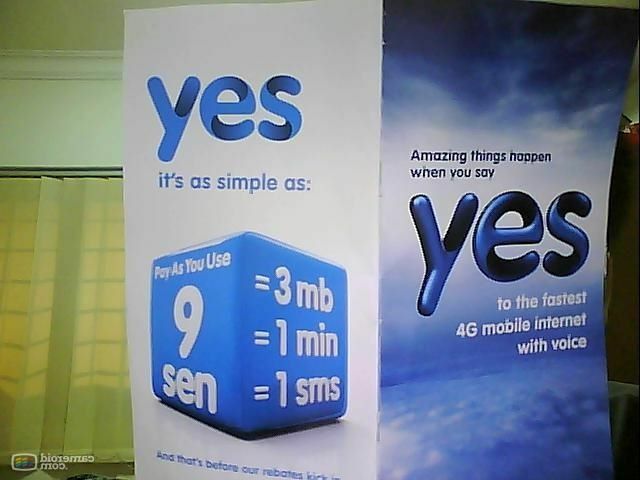 9 sen per sms is… hmm ok.
9 sen per data, means 3 sen per 1mb. Lets take standard 700mb usage (for downloading or streaming content of a size of CD), it will cost you RM21. They claim its the fastest network, and you can stream video without without waiting for the buffering. Lets say you signed up for YES 4G, you will say wow this is really fast, then go and watch youtube videos, watch some revision 3 videos, and watch some livestream, stream MP3 facebook twitter etc. YES! ITS REALLY FAST! After one month, when your bill come, your YES will become WOW and then become OMG then you will die. But lets put this into mobile wireless broadband network perspective. 1GB = RM30. I think is a lot cheaper than many network out there named D, M, C, P, and etc. My one more concern is WILL THE voice call bandwidth be seperated or still counted in the data rate? Shouldn’t be right? Yes4g? You shouldnt be doing heavy download on the go right?! some light surfing, tweeting and facebooking is fine. I bet you wont even reach the 1gb mark. 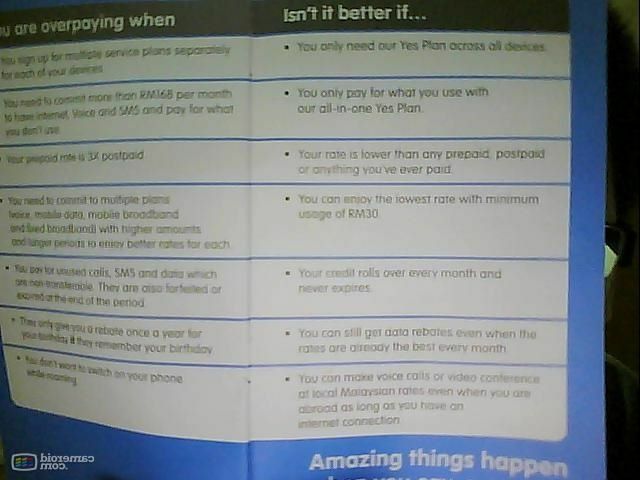 But beware that, You can enjoy the lowest rate with minumum usage of RM30 which i mentioned above. YES 4G. Just my 2 cents, and its base on really minimum of information i have. We will find out the truth on Friday. Watch my tweet. I will sure livetweet the event. Go to http://www.yes.my/ for more real info. Oh, RM21 for downloading a movie, that doesn’t sound cheap at all! That’s freaking expensive! Haha… anyway, looking forward to what’s coming up on Friday! Do update us. not really interested in a new provider, but thanks for the info.